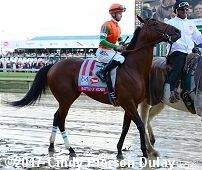 The 143rd running of the $2 million Kentucky Derby (G1) Presented by Yum! 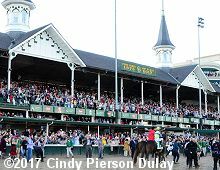 Brands was contested over a Churchill Downs main track soaked after 2 days of rain, however the 158,070 fans in attendance were able to enjoy the race under partly cloudy skies with a race time temperature of 63. With no scratches, the originally drawn field of 20 all went to the starting gate for this 1 1/4 mile classic, with the two also-eligibles Master Plan and Royal Mo excluded. 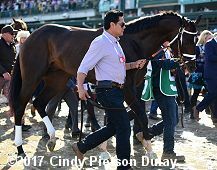 Always Dreaming was sent off as the 9-2 favorite, winner of three straight including the Florida Derby (G1) for his final prep. 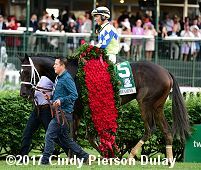 In to challenge him for the Garland of Roses included 5-1 second choice and Wood Memorial (G1) winner Irish War Cry, 13-2 third choice Classic Empire, Breeders' Cup Juvenile (G1) champion and winner of the Arkansas Derby (G1), and 7-1 fourth choice McCraken, third in the Blue Grass Stakes (G1). Always Dreaming leads down the stretch. When the gate opened at 6:52pm ET, 42-1 Fast and Accurate broke inward from post 3 on 16-1 Thunder Snow in post 2, causing the already rank Thunder Snow to start bucking and refusing to continue, almost unseating jockey Christophe Soumillon. Soumillon pulled him up at the 3/16 pole and he was led off the track to the safety of the paddock by the outrider with no apparent injury. 54-1 State of Honor and jockey Jose Lezcano went to the rail and to the lead first time past the Spires through opening fractions of 22.70 and 46.53 while pressed by Always Dreaming just to his outside in the 2 path, and 40-1 Battle of Midway. At the half mile pole State of Honor began to tire as Always Dreaming and jockey John Velazquez inherited a short lead over Battle of Midway through 3/4 in 1:11.12. At the top of the lane, Always Dreaming continued to hold a 1/2 length advantage through 1 mile in 1:37.27. Asked for run by Velazquez, Always Dreaming opened up a 3 length lead on late-closing 33-1 Lookin At Lee at the 1/8 pole, and finished up under wraps 2 3/4 lengths clear in 2:03.59 over the wet-fast track. 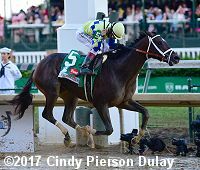 It was another 5 lengths back to Battle of Midway third, and 1 length more to Classic Empire fourth. There were six other stakes races on the card with the Derby. Full results for all of them with more photos are here. Left: Always Dreaming parades with the Garland of Roses. 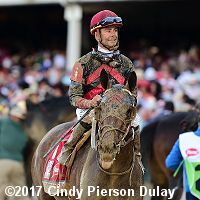 Winning jockey John Velazquez, celebrating his second Derby win, said, "This is the best horse Todd and I have ever come to the Kentucky Derby with. Nothing against all the others, but this was the best horse. I got a good position with him early and then he relaxed. When we hit the 1/4 pole, I asked him and he responded. He did it himself from there." 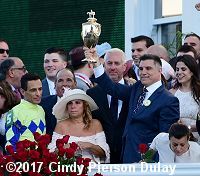 Right: Co-owner Anthony Bonomo raises the Kentucky Derby trophy. Bonomo said, "My dad used to like to watch the races. We didn't go as much as we would like because he worked so much in the day. He was a laborer, a bricklayer. Where I really got into it is when I met my wife. Her dad, who, unfortunately, isn't here anymore, loved racing and just loved being at the barn. So to a large degree he was here today. I think they were all riding that horse with Johnny. I used to have some great times with my father-in-law. And, you know, the inspiration came from him loving it and then my wife loving it. I wasn't much of a big fan. I used to like to sneak into a track occasionally with him, and we would have $3 between us. And we would beg some older man to put a bet on it for us. He said, 'How old are you?' I would say, "24." It is surreal." Left: Always Dreaming in the traditional walk over to the paddock from the barn. 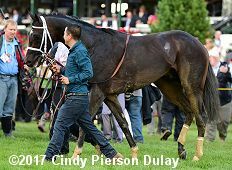 Pletcher said, "I don't think we were going to get to the race in as good a shape as we did without them. He's an intelligent colt. And, you know, he was aggressive. He was wanting to run. The rider tried to restrain him, and he put his head up in the air to break the rider's hold. We felt the draw reins would control him better, bring his head down, give the rider better control. The main thing is I wanted to control the pace of his gallops. He was, essentially, wanting to run the race in the morning, and we couldn't do that." Right: Always dreaming in the post parade. Asked about the Triple Crown, trainer Todd Pletcher said, "My initial impression is he finished the race great. He galloped out well. He came back to the winner's enclosure and seemed like he caught his breath pretty quickly. If he's doing well, we're going to go to Baltimore. I don't think I'll have to twist anybody's arm (owners) here to do that. We'll hope." Left: Always Dreaming heads back to the barn. 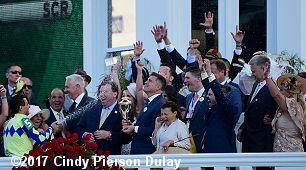 Winning trainer Todd Pletcher, also celebrating his second Derby win said, "I knew we had a big shot with this horse and I was hoping it would happen. The trip unfolded not exactly the way we had planned. We knew for sure we didn't want to be behind a wall of horses and that turned out OK. Johnny of course rode him great. This is so special to win this race with Johnny. We've been together for all these years and this is sweet. I'm sorry I don't have a clue about my other two horses. I was so intense following Always Dreaming up front that I never did get a chance to pick them up." Right: John Velazquez celebrates by spraying co-owners Anthony Bonomo and Vinnie Viola with champagne. Viola said, "Someone asked me on the way in, is this the greatest feeling you have ever had? And I said yes. And he said, the best? Well, besides the birth of my children and meeting my wife. But for me, Anthony and I, I think, represent everybody who went to the racetrack for the first time with their dads and were just astonished by the brilliance of these athletes, these equine athletes. Never fell out of love with the sport. And to sit up here, we have to say, really, we are two kids still in our heart from the Williamsburg section of Brooklyn, who always dreamed. And this is one of the dreams to come true." Left: Second place finisher Lookin At Lee returns to the unsaddling area covered in mud. Trainer Steve Asmussen said, "I'm definitely proud of 'Lee.' He just keeps coming. Drawing the one was tough. He's the first horse in 20 years to run in the top three from the one hole. A lot of credit goes to Corey for navigating a very good course from there. To me, the Kentucky Derby, everything about it is a thrill. I'm just proud of the effort of Lookin at Lee and the whole team." 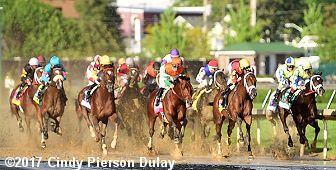 Jockey Corey Lanerie added, "My horse ran great. 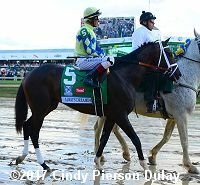 I'm caught with seconditis � second in the Preakness and now second in the Derby. I'm still very happy." Right: Third place finisher Battle of Midway in the post parade. Trainer Jerry Hollendorfer said, "I thought our horse gave a nice effort. We had a good position coming into the lane but Todd's horse was too good." Jockey Flavien Prat added, "We got a good trip. He broke well from the track, took me right there. He ran a huge race. He gave me everything he had." Left: The Kentucky Derby 143 field shortly after the start. Jose Lezcano aboard pacesetter and eventual 19th place finisher State of Honor (6 horse, red silks with yellow cap in front) said, "I think my horse didn't like the sloppy track. He broke good, I put him in a good position and let him go a little early. He stopped early but I think (on a fast track) he can go longer." Eventual winner Always Dreaming (5) is on the rail in second place at this point. Right: Always Dreaming under the Twin Spires of Churchill Downs. Velazquez said, "Once I got the position I wanted, I was comfortable where I was. Obviously, he wanted to take the lead. It made it easy for me to get back from behind him and get into the clear instead of being down in there. Once I got him to the outside, he relaxed really well. Before they came to me in the back stretch and he got into the bridle, pass the horse that was in the lead, I went right back to the rail. And I held him together whatever he was comfortable. He was doing it really well. And he was taking me, and he had a nice rhythm. He had a good hold with me. After that, it was pretty easy."